ALCOR (80 Ursae Majoris). Alcor, forever tied to Mizar, is hardly ever spoken of unless as "Mizar and Alcor," a naked eye double in the tail of Ursa Major that are 11.8 minutes of arc apart and that the Arabs referred to as the "horse and rider." The two are usually taken as a test of minimal vision. The name Alcor was stolen from that for Alioth. Both come from an Arabic word that means the "black horse." The term was distorted in different ways as it was applied to each of the two stars. Oddly, the "rider" of the pair is the one with the name of the "horse," "Mizar" referring not to a horse but to the "groin" of the Great Bear. A great many stars with Bayer Greek letter names have no proper names. Alcor is one of the very few in reverse, a star that has a proper names but no Greek letter name. Instead, it is referred to as 80 Ursae Majoris. In the early 1700s, the English astronomer John Flamsteed organized a new catalogue of stars in which they were ordered from west to east within the constellations, Alcor number 80 in Ursa Major. " Flamsteed numbers" are commonly used when the Greek letter names run out. 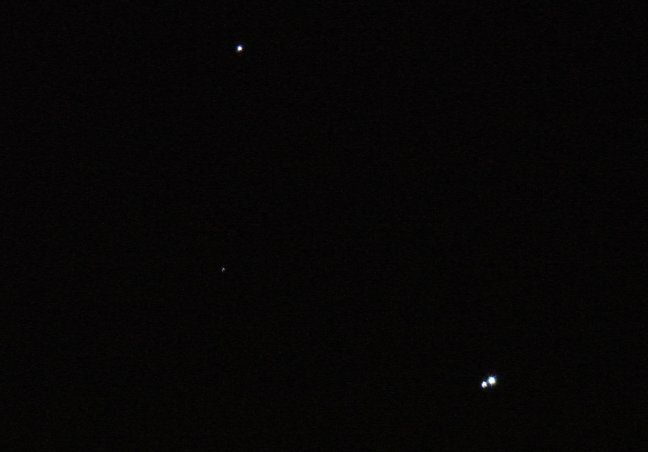 Mizar (the brighter) and Alcor appear at dead center. Separated by 11.8 minutes of arc, are they a real orbiting pair? Probably. Measurements allow them to be at almost the same distance of 82.2 light years. In one magnified swoop we see the whole system, the famed naked- eye double formed by Mizar (also a visual double) at lower right and Alcor at upper left, the two separated by just under 12 minutes of arc. All three are again double, yielding a sextuple system. The faint and quite unrelated star just to the lower left of center carries the unwieldy proper name of Sidus Ludovicianum in honor of the deceased Ludwig V of Hesse Darmstadt (1577-1626). Image courtesy of John Thomas. Alcor is a fourth magnitude (4.01) white class A (A5) hydrogen-fusing dwarf star with a temperature of 8000 Kelvin and a luminosity 12 times that of the Sun. It appears coupled with Mizar, but is it really a physical companion? We are still not sure. Mizar itself is a quadruple star on the "double-double" theme (two double stars in orbit about each other.) Precision parallaxes with the Hipparcos satellite show Mizar to be 78.1 light years away, but Alcor to be 81.1 light years distant. Mizar and Alcor are part of the Ursa Major cluster, whose core consists of the middle five stars of the Big Dipper. A separation of over three light years, almost the distance between here and Alpha Centauri, would make a gravitational pairing unlikely as the neighboring stars would pull them apart. The measured errors, however, allow a separation as close as 0.7 light years. The errors in the distances are suspected of being greater than listed, and the analysis of the orbit of Mizar A suggests that Mizar might actually be FARTHER than Alcor! If they are actually at the same distance, their minimum separation is only 0.27 light years, making them close enough so that they could truly orbit, though with a long period of three-quarters of a million years. 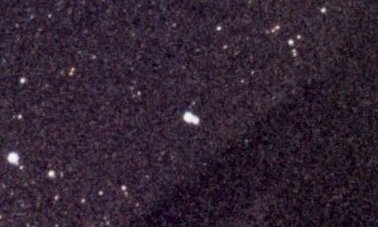 For a time Alcor was thought to be double, but it now appears that early astronomers were fooled and that it is really single, rendering Mizar and Alcor together a "quintuple star." While the Mizar stars are slow rotators with peculiar chemical compositions as a result of element separation, Alcor is a rapid spinner (218 kilometers per second, over 100 times solar). As a result, its atmosphere is stirred and its composition normal. It is, however, a slight pulsating variable. The inner five stars of the Big Dipper are all at roughly the same distance and all are normal hydrogen fusing main sequence dwarfs. Alcor's faintness next to the them is a vivid reminder of the role that mass plays in the stars. Alcor's mass is around 1.8 times that of the Sun. Alioth, on the other hand, with almost twice Alcor's mass, is almost 10 times brighter! Update: Alcor is binary. Sophisticated infrared observations in which the light from Alcor proper was blocked out reveal a close companion+ about a second of arc away. Common parallaxes and motions show it to belong to Alcor. From its brightness, the companion has a mass around a quarter that of the Sun, making it a class M3 dwarf. With a minimum separation of 25 Astronomical Units, the little one would take at least 90 years to orbit its more massive mate. If Alcor and Mizar (a quadruple star) actually orbit each other, which they probably do, then the system is not just quintuple, but sextuple. Though the pairing of Mizar and Alcor is still not clear, it is likely. The second Hipparcos reduction places Mizar 85.7 light years away, Alcor 81.7, but the error in Mizar's distance is quite large, the result of its multiplicity. The double-star orbit, on the other hand, gives Mizar's distance as 82.8 light years, making them much closer together. The measurement errors could allow them to be almost at the same distance of 82.2 light years. If indeed at the same distance, Mizar and Alcor could be as close as 0.28 light years apart. Written by Jim Kaler 7/07/00; updated 5/02/10. Return to STARS.